Located in the heart of downtown and inside the Portola Hotel & Spa is the best breakfast in Monterey, CA for buffets – The Club Room. Start your morning off in our relaxing and cozy fireside dining room while enjoying a European-style breakfast buffet served with Peet’s Coffee® and bottomless mimosas. Open daily, The Club Room utilizes local and fresh ingredients to serve plates carefully crafted by our Executive Chef Danny Abbruzzese and his culinary team. The Club Room is regarded as one of the best brunch restaurants in Monterey offering a fresh, seasonal, buffet featuring made-to-order omelets, assorted house made pastries and muffins, sliced cold cuts, fine artisan cheeses and much more. Dine in our cozy fireside dining room, or breathe in the fresh coastal air on our outdoor, pet-friendly, heated patio. We are excited to partner with Paso Robles’ DAOU Vineyards & Winery for our first wine dinner of the summer season. Join us at The Club Room Monterey and experience a five-course pre-fixe dinner paired with a special selection of DAOU wines. $90++ per person. Reservations required, please call (831) 649-7874. Pricing includes tax and gratuity. Relax, rejuvenate and brunch with our new Massage + Brunch for Two offer! The award winning Spa on the Plaza and The Club Room, both located at the Portola Hotel & Spa have created the ultimate relaxation package for visitors and locals alike. Soothe your spirit and invigorate your whole body with lavender, eucalyptus, and citrus spice aromatherapy blends with a 50 minute Aromatherapy Massage for two. After your massage relax in the dining room at The Club Room or take in the coastal air on the heated patio as you enjoy a European style breakfast buffet including made to order omelets, house made pastries, fresh fruit, bottomless mimosas and more! To book this exclusive offer, call the Spa on the Plaza at (831) 647-9000. The Club Room is an elegant fireside dining room offering an intimate setting for your special occasion. A standout in Monterey event venues, The Club Room features a seasonal menu with the freshest local ingredients alongside a professional curated Monterey County Wine list, The Club Room offers a private dining room and an outdoor, heated patio to accommodate your special event in style. The Club Room can accommodate casual or elegant celebrations with seating up to 120. 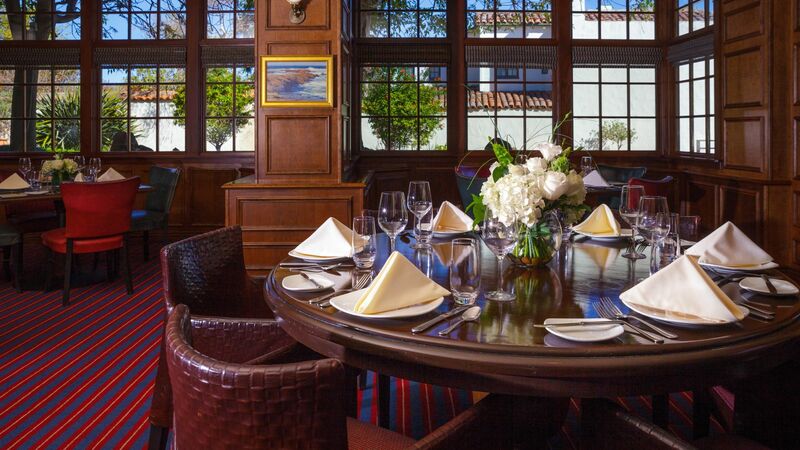 Ideal for intimate events, our wine-inspired and glass-enclosed private dining room has become a sought after location among event venues in Monterey. An idyllic setting for luncheons, bridal showers, rehearsal dinners and celebratory occasions, The Club Room offers seating for your party of up to 22. Breathe in the coastal air while dining on the enclosed patio at The Club Room. The outdoor, heated patio features a fire pit and patio seating for up to 40. To learn more about our options for private dining or to begin planning your next special event at The Club Room, complete the following request for proposal or contact us today at (831) 649-7874.